If you knew that YOU ARE PURE MAGIC, assertiveness would be a piece of cake. What is assertiveness anyway? There are all kinds of definitions. You can probably find all kinds of online courses but I believe it is something that springs from within when we are comfortable with who we really are. Assertiveness comes from a place of authenticity and ease because we are comfortable in our own skin. It is neither aggressive nor passive. It is balanced and cordial. It has an elegance and a grace. It has an appreciation for others and where they are on their journey. Assertiveness knows exactly what to say, when to say it, how to say it and even when to remain silent. It is humble but bold as it knows that it is deserving to take up space in the world. It feels appreciation for the energy it projects as it knows it is a valuable contributor. It honors and absorbs fully the voice of others. Assertiveness has an energy of its own that allows the love that is our birthright to flow through us and be shared with integrity, dignity, and respect. Much can be discovered by observing ourselves and how we think and feel in situations. Those experiences, whether they are in the quiet recesses of our imagination or externally tangibly driven is the beckoning our inner intuitive to assert her/himself as a gift to the world. Imagination is the bridge to our true reality where we feel complete, whole and unified. It is a space that we can travel to instantaneously. And, the good news is that there is a world beyond our imagination and beyond that and beyond that and beyond that. It is infinite, vast, expansive and eternal. When we enter into that space of the unknown, we embrace the knowingness that WE ARE PURE MAGIC. You are a living breathing MIRACLE. Those are pretty long odds to form a miracle so you are starting out in a really great position of success just by being here. 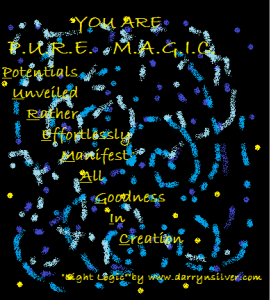 Potentials Unveiled Rather Effortlessly Manifest All Goodness In Creation. So what does all of this mean? Well, that’s what we are doing here. We are aiming to create or manifest all goodness in creation and we each have the potential to do just that. The challenge is to have the COURAGE to look under the veil. All it takes is the willingness to be open and honest with ourselves. When we look at what we don’t want to look at, a miraculous thing happens. That thing we did not want to acknowledge, that thing we were denying, that thing we were terrified of, that thing we were resisting evaporates, dissipates, dissolves, and becomes none existent. We moved to a different place. We are able to be in our essential heart space which holds its awareness on the LIGHT and then we project that out into the world externally. So what are you going to pay attention to? It is a powerful CHOICE that is ours and ours alone to make. 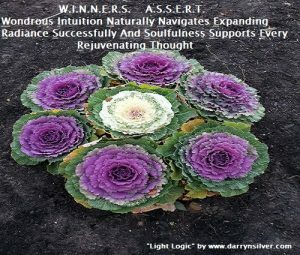 How do you want to assert yourself? What topics do you want to spend time on conversing? For me, assertiveness seemed easy until I entered into arena of the unknown. To assert myself became a terrifying exploration for me to let go of control of how things are meant to unfold, who I am in the grand scheme of things and how I want to show up in the world. 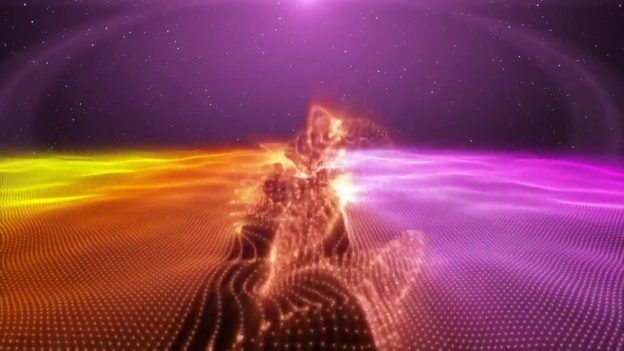 Instead of feeling like “boundless choices from infinite potentialities unveiling themselves”, it felt more like “lots of decisions to make.” Can you feel the difference in the energy in the two perspectives? The former is an opening to grand possibilities and the latter feels more forced, pushed and hard. Learning how to assert myself in new and untethered ground offers “Treasures Beyond Measure” as well as discoveries and comprehension of my soul’s intent. So, if you find yourself in a new situation, a new place whereby you do not know yourself fully, here are some pathways. You try them on for size and see which fits for you. 2. Practice various expressions in front of the mirror making eye contact with yourself, gesturing and smiling to experience how you FEEL. -Thank you so much for sharing your ideas with me. -I always want you to feel that you can come to me and tell me what is on your mind. -Would you be open to brainstorming with me? 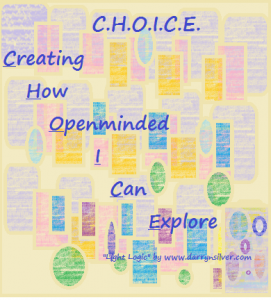 – I have a couple of ideas I would like to share with you and see what your thoughts are. -I made a mistake and I would like some guidance on the best way to correct it. -I really consider your input valuable so thank you for bringing this to my attention. 3. If you are at a loss, imitate someone you admire to have grace, poise and sensitivity. It will eventually morph into your own signature. 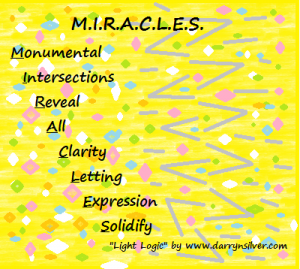 -Notice the vocabulary you use and choose your words to be life affirming and up-lifting. Energy begets similar energy. 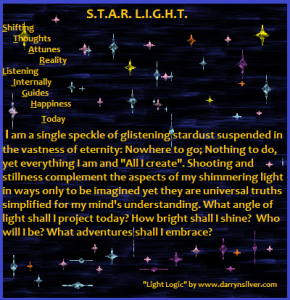 What your project, the Universe reflects! -Move your body actively prior to the communication to loosen any stale energy collecting. 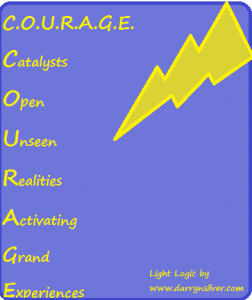 -Think about how you are growing and feel good about your courage. 4. Remember that if your intention is well meaning, your expression will be fine. This entry was posted in Blog on March 25, 2017 by darrynsilver.